Like most Americans, I love a good latte. Not too sweet, not too bitter, a romance between cream and espresso, those are the qualities of a good latte for me. So when I travel finding a good latte is almost a challenge that I always accept. This visit to London I wanted to get away from the touristy things that I’ve done before and try something different… a coffee crawl around the city in search of the best places and to warn you of some of the worst. Living in Seattle I have my choice of absolutely fantastic coffee shops, my favorite is Storyville coffee right downtown next to the Pike Market. There you will find the perfect combination of dramatic flavorful coffee, a perfect ambient temperature, cozy seating and the authentic feel of what a coffee house should be. It’s truly my favorite place to hide out in Seattle. London isn’t known for coffee, however, in the last few years, they have actually tried branching out and opening up some lovely coffee venues. But finding them wasn’t easy. I had to “Mind the Gap” many times to seek out these hidden gems to bring you an excellent coffee crawl article. Through rain and wind, we found these places for you. It was raining, I was cold, and I just wanted the comfort of a latte. Looking around before heading to the tube station by the Borough market, I just wanted something good. I’d already tried the fancy coffee place in the market ( more about that later), and this time I wanted something without the attitude. This is the perfect decaf vanilla latte. Thanks Mousetail Coffee Stories! That’s when I discovered Mousetail coffee almost right next to me. In fact, I’d passed it a few times that week because it is inside the John Harvard Library and I hadn’t noticed it. So heading into the library, I quickly found the scent of freshly roasted espresso beans calling my name. Almost timidly I ordered my usual, a tall decaf vanilla latte, and waited for the response. Now that might be weird, but this hadn’t been the best week for actually getting what I wanted. The barista smiled and asked if I wanted anything else. I just had to laugh and look at the beautiful case of fresh pastries. They all looked fantastic. But we were heading to dinner, and I didn’t want to ruin my appetite. Just the latte would be enough. Here is where the magic happened. And yes, I watched every step! The perfect pull of espresso streamed lightly down into the waiting shot glass, dark and just the right crema floating to the top. Yes!!! Next, the milk was steamed to a lathery perfection and poured by his talented hand. I might have actually fallen in love with him at that moment.. just a little. This was actually the best latte in all of England, and I was giddy as I sat down. The taste was delicate and intricate, not too sugary and the roast of the coffee was almost sweet enough without the vanilla. They didn’t know that this was my mission, they were simply kind, friendly, and masters of the latte. Cozy and warm, Hej is delightful. You should try Hej for the coffee shop experience. Hej is adorable inside with comfortable and cozy seating, a variety of little things to buy, and pretty good coffee. It has a lot of tables that make it a bit claustrophobic and bit too warm, but it's decent coffee and better than most of the other coffee shops in the area. In fact, it's probably better than most of them in London. Not a lot of variety, but the coffee is decent. One of the things that I really liked was a long table in the middle that had a small sign that said “No Laptops,” and several people had met there to sit and talk. At first, I was confused, thinking that the long table would have been better for the laptop users and the small cozy tables better for chatting. But as I watched, I loved seeing the interaction with people at the table. Making it more accessible to strike up a conversation over coffee rather than hide behind the technology wall. So it grew on me and so did my affection for this location. Does anyone else see a kitty in my latte? Anyone? 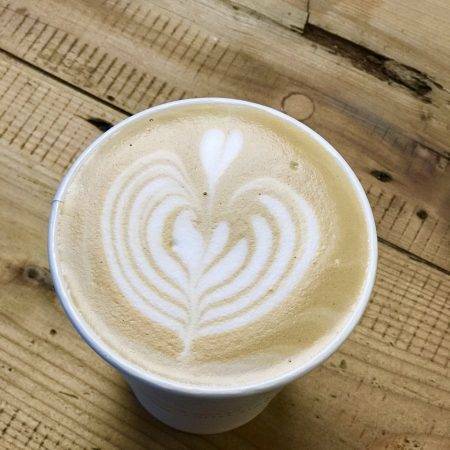 Intense, rich, and satisfying, the flat white from the guys at the Flat Cap cart in the heart of the Borough market is worth mentioning. There’s no sticky sweet flavors or pastries, just good coffee at a fair price. A simple cup to walk around the market with without the arrogance. Paired with a local delicacy from one of the other booths, you will be delighted. Yep, I had to stop walking, take a few steps backward and look again. I thought at first it was some sort of German deli. The storefront is plain and kinda cold, but as I looked back at the window advertising girls girls girls and the name… it’s no ordinary coffee joint. This quirky hipster joint serves up quick espresso, comfortable seating for engaging with the internet through the wifi. Bermondsey Street has its own style. It’s peculiar and fun, but also multicultural and experienced, unlike the sophistication of much of London. This place is no different. But quick warning, this is NOT a place to bring the kids. This has a defined adult theme, and though the punny menu is funny, you might not enjoy the sexual overtones. But then again… it’s FUCKoffEE. What did you expect? Even though this place has a prime location in the Borough Market, don’t let the crowds fool you. The coffee is crap, the staff is blatantly rude, and it isn’t comfortable or enjoyable at all. I wish I hadn’t bought into the fake hype and ventured into this tourist trap posing as a reputable coffee shop. If you love being looked at like you are an idiot for asking for the basic decaf vanilla latte that I’ve enjoyed around the world, then this is your place. They only have burned uncreative flat whites or espresso. Our flat white was gag-worthy and expensive for a tiny shot of pretentious crap. Let me say this, I normally do not post negative reviews. If I don’t like it, I just move on. But the obnoxious brashness from their jerk barista really upset me. I heard others ask about alternative milk options and got the same attitude. They do not want your business, nor does it seem like they need it. The coffee is overly expensive and better can be found very close at Mousetail across the street. The Breakfast club is always packed and it is actually worth the wait! We loved the breakfast and the experience. The waitstaff is fantastic and there is always something cool and new to look at while you wait. We really love the food here and the latte is lovely. So while we came here for the breakfast, it was worth and honorable mention for our coffee crawl. Overall, coffee isn't the most memorable in London. There are a few spots worth exploring. But there are so many other great things to see in London that are actually more fun. I love London, and there are a lot of coffee spots coming to the city. I’d love to hear your favorites.